This hotel accepts credit cards only. There will be no cash accepted for any type of transaction. Extended parking available; must book Park and Stay package. Free parking is for daily/overnight guests only. 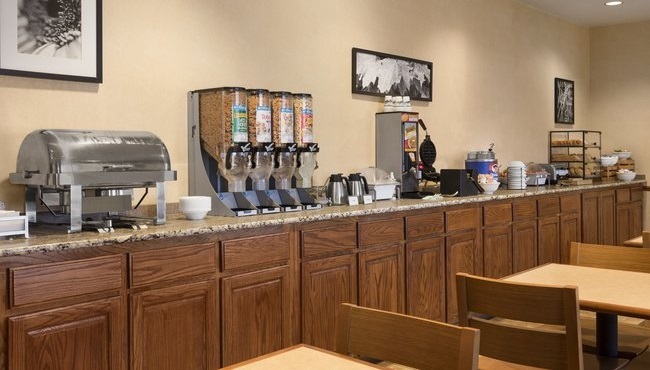 With a rotating selection of items including biscuits and gravy, Belgian waffles and French toast, our free, hot breakfast is the perfect way to wake up. Pair a variety of cereals with fresh fruit, and wash everything down with a steaming cup of coffee. For lunch or dinner, head to one of the nearby restaurants, like PepperJax Grill for tasty cheesesteaks or Upstream Brewing Company for classic pub food. Mon-Fri, 5:00 a.m. - 9:30 a.m.
Sat-Sun and Holidays, 6:00 a.m. - 10:30 a.m.